The publication of the High Level Design (the “HLD”) of the Renewable Energy Support Scheme (“RESS”) on 24 July 2018 gave the clearest picture yet of the support which will be made available to new renewables projects developed in Ireland over the coming years. The HLD is, by its nature, short on the type of practical detail which will ultimately be required by developers as we approach the first RESS auction (“RESS-1”) (expected to be held 2019). Given the seismic change in the nature of support offered to new renewables projects from REFIT to RESS, it may be illustrative to look at the experiences of other jurisdictions which have introduced similar floating feed-in premium based support mechanisms. Ireland’s closest neighbour, Great Britain, introduced such a scheme several years ago (“GB CfDs”). In this article, we look at the process for allocation of GB CfDs and consider what lessons should be learned when allocating support under RESS. To date there have been two GB CfD allocation rounds (with a third scheduled to occur before May 2019). The UK Government confirmed funding for a number of CfD allocation rounds in its March 2016 Budget. An indicative budget notice for the second CfD allocation round (“AR2”) was published in November 2016, with detailed eligibility rules and a final budget notice published in February and March 2017 respectively. As a consequence, prospective applicants had good visibility around eligible technologies, available budget and likely timing of allocation rounds and as a consequence, sufficient time to factor this into their project programmes and prepare bid strategies. The Department of Communications, Climate Action and Environment (“DCCAE”) would do well to ensure that key details required to inform bidding strategies are made available to prospective applicants as far in advance as possible of the commencement of a RESS auction process. 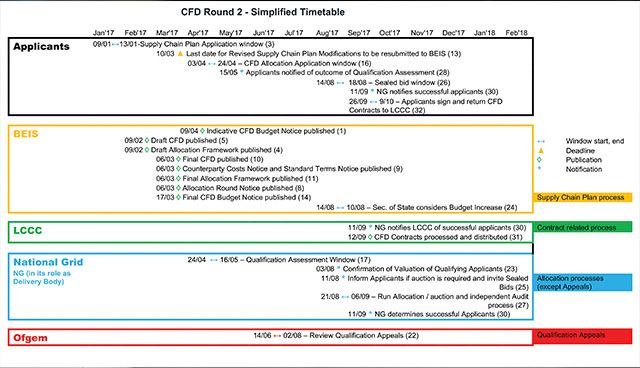 An indication of the overall CfD allocation timeline (from indicative budget notice being issued until CfDs are signed) can be seen from figure 1 below. While the description of the RESS allocation process in the HLD confirms that auctions will be held (not something automatically assumed in the GB CfD allocation process), experience would suggest a timeframe from confirmation of the amount of GWh being auctioned to issuance of RESS-1 CfDs of several months. The HLD expressly notes that projects seeking support under RESS-1 will need to be operational by 2020, to address concerns that Ireland will miss its binding 2020 RES targets. In order to allocate support in time to allow successful projects to be operational in the next 26 months, the date of RESS-1 and key auction parameters will need to be communicated to the market in short order. A developer who is allocated a GB CfD is required to enter into a 15-year private law CfD contract with the Low Carbon Contracts Company, (a private limited company which is wholly owned by the UK Treasury). A copy of the standard form CfD for an allocation round is issued by the UK Government a number of months prior to that allocation round’s application date. This gives prospective applicants time to review the terms of the contract and gain an understanding of obligations they would be assuming if their application is successful. Assuming the contracts awarded by DCCAE to successful RESS applicants are similar in length to the UK equivalent (the UK CfD running to almost 600 pages), it will be incumbent upon DCCAE to publish drafts well in advance of auction processes commencing to give prospective applicants time to understand key contractual requirements. In addition, the HLD does not make clear who the counterparty to the RESS contract will be. It will be important for prospective applicants (in particular those seeking to raise external finance to develop their projects) to understand the creditworthiness of the RESS contract counterparty. Consequently DCCAE should aim to confirm this piece of information as early as possible. Issuance of a CfD under RESS or the GB CfD regime is of course not the end of the journey for a successful developer. 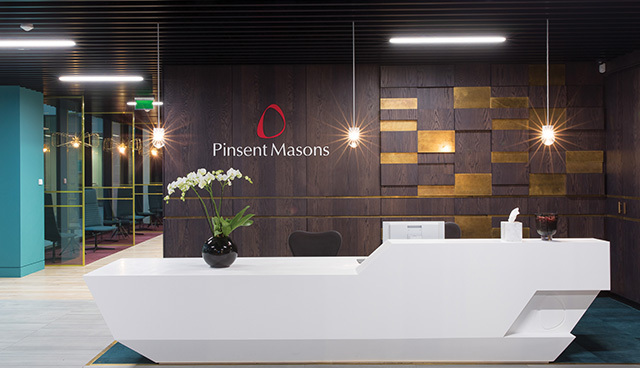 As the HLD indicates will be the case with RESS, developers who are awarded GB CfDs must satisfy a number of conditions precedent upon entry into the CfD (and further conditions precedent before payments commence). In addition, GB CfDs contain milestone requirements which require developers to provide evidence of having placed certain key construction contracts or spent a proportion of their expected project capex within a certain period of time from entry into the CfD. A failure to satisfy conditions precedent or milestone requirements by applicable long stop dates risks the LCCC terminating a developer’s CfD. The GB CfD regime contains a non delivery disincentive, pursuant to which a developer who either doesn’t sign a CfD it is allocated or has the CfD terminated for failure to satisfy initial conditions precedent or milestone requirements by an applicable long stop date is excluded from applying for a further CfD for such project for up to 24 months. The HLD notes the potential use of a similar non-delivery disincentive for RESS allocation, as well as a requirement to submit bid bonds. Details of any conditions precedent and milestone requirements to be satisfied, timeframe for satisfaction and consequences of failure to satisfy same are key details which prospective applicants for RESS support will need early clarity on, as these will be key dates to be included in a developer’s indicative construction programme. In addition, details of bid bond requirements will need to be factored into developer’s financial models. While the Irish Government’s commitment to supporting new renewables development through RESS is to be welcomed, the change from a feed-in tariff-based support mechanism to a floating feed in premium mechanism such as RESS is a profound one. With profound change comes uncertainty and while the HLD has gone some way to clarifying how RESS support will be allocated, the devil is in the detail we have not yet been provided with. Helpfully for the Irish Government and developers of new renewables projects in Ireland, many European jurisdictions have recently adopted similar support structures (in line with EU State Aid Guidelines). Consequently, there is a wealth of best practice and lessons which Ireland can learn from its neighbours, not least Great Britain. The hope is that Minister Bruton and his staff at DCCAE take advantage of these lessons to ensure that clear and timely detail is provided to developers ahead of RESS auctions. Informed and prepared bidders contribute towards competitive auctions, something Ireland needs if it is to achieve if not surpass its renewable electricity targets over the next decade. 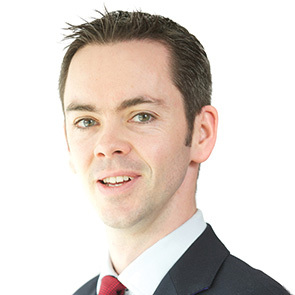 Ronan Lambe is a Legal Director in the Irish Energy team at Pinsent Masons.